It’s the holiday season and Heineken Green Room is treating you to an amazing end of the year celebration. 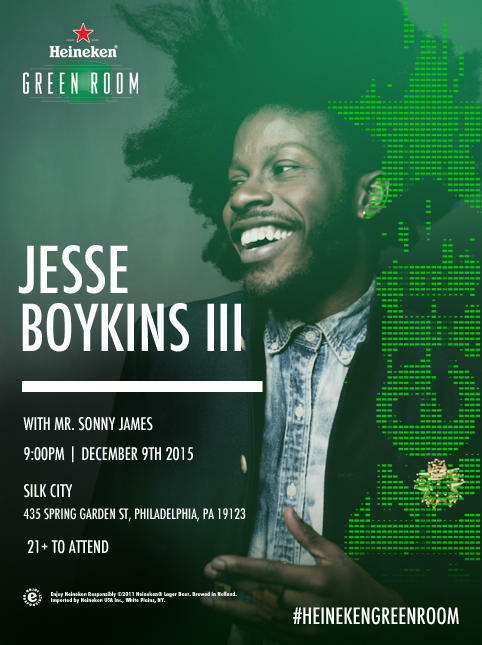 We’re bringing the captivating Jesse Boykins III, who embodies soul and style, for an intimate performance at Silk City as we bid farewell to 2015 and get ready to welcome a bigger and better 2016. The Mr. Sonny James will be on deck to bring us his getupanddance beats all night long. This event is open ONLY to Heineken Green Room Insiders. Must RSVP +1 friend by December 7th at 5pm. RSVP does not guarantee admittance, so arrive early, as entry will be rst come rst serve.